Origin: Covers most of the eastern United States as far north as New Jersey and west into parts of Utah and Colorado. 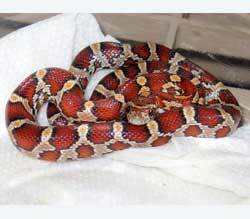 Habitat: The corn snake's name is derived from the fact that it is frequently found in corn fields. Members of the rat snake clan can have stripes, blotches, or a combination of stripes and blotches; even unicolored species can be found. Corn snakes have an attractive "checkerboard" pattern on their ventral surfaces. Color of the ventral scales is usually black and white. Housing for the rat snake group can be simple. Cages should be escape-proof, roomy and well-ventilated. Hide boxes are appreciated by most forms. Substrates that work well include pine shavings, newsprint, indoor-outdoor carpeting or paper toweling. These animals do best with ventral heating--provide a heater on the bottom of one side of the cage setting up a temperature range from which the animal can select its preferred body temperature. These snakes can be maintained on adult mice or rats, as their name implies.